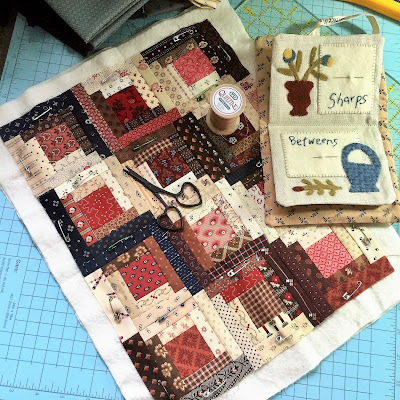 A Sentimental Quilter: The Shortest Month. And the Pinkest . . . The Shortest Month. And the Pinkest . 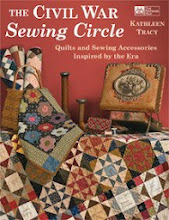 . .
February is the shortest month so if you have quilting goals, you'd better get cracking. Here's Block #2 of my Mystery Quilt for 2019. Have you joined in yet? 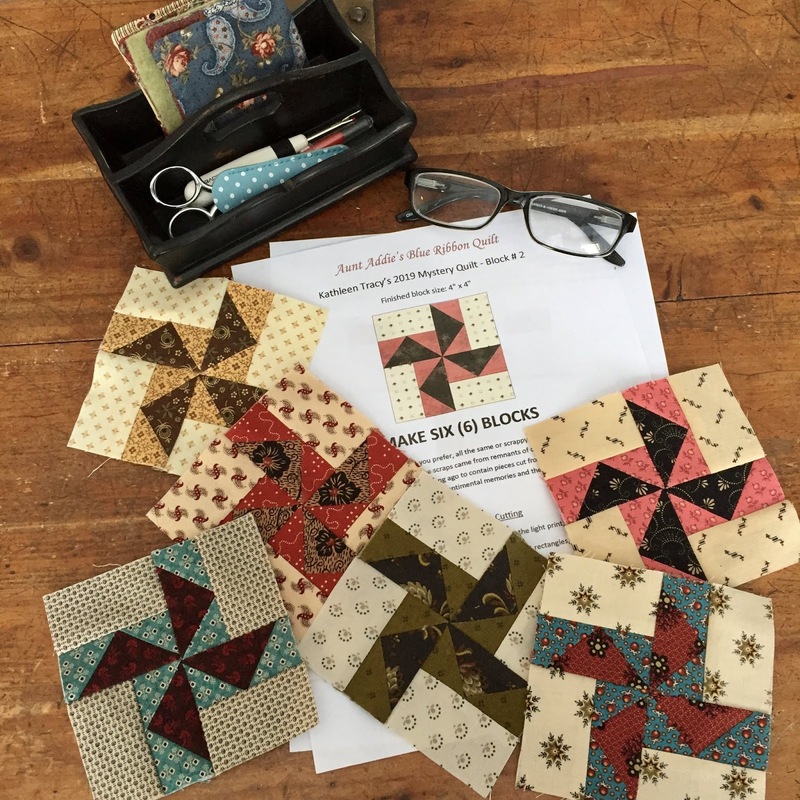 It's free and the patterns for the blocks are posted monthly. We're moving right along. The mystery will be revealed in July. You can download the monthly patterns from Files in my Facebook small quilt lovers group or the Mystery page on my website. I love this block! It's called "Louisiana" and it's fast becoming one of my favorites. Very simple and yet if you use some pretty fabric combinations with nice contrast it looks more complicated than it really is. Quick and easy. Pattern is in Files in the groups. Here's a little more inspiration for February. If you haven't made the Be My Little Valentine quilt from my Small & Scrappy book yet, this may be a good month to get that one finished. Also simple and cute. Doesn't get much easier than four patches. 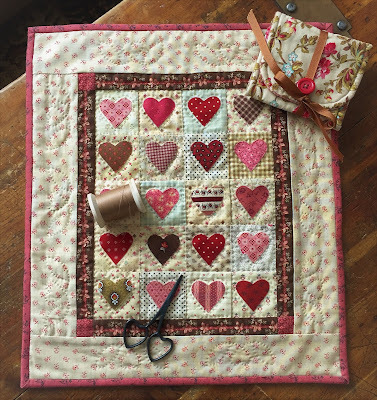 More pink and brown - Last February, I started this sweet little hearts quilt and was finally able to finish it last week. I created some kits and also put a pattern up on my website. 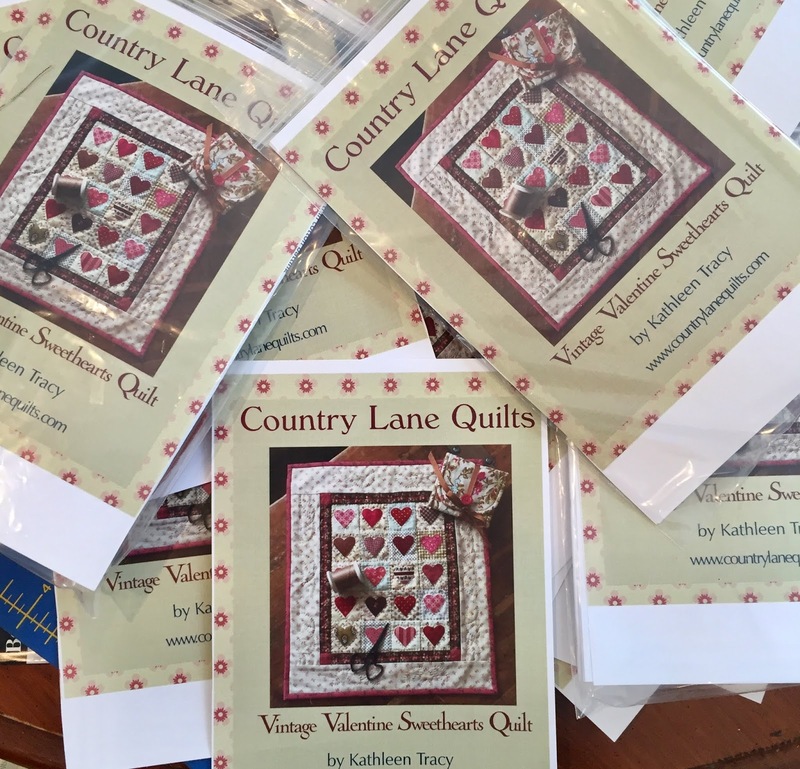 The kits have already sold out but if anyone would really, really like to purchase one, you may be able to twist my arm to make up a few more so please e-mail me (click on my blog profile for e-mail). I will do this if there's any interest. But I'd have to buy more fabric and you probably won't get them before Valentine's Day. So, let me know. You can also purchase the pattern alone and use your own scraps. These little blocks really make my heart sing. Make something with pink in it to perk yourself up and get over the gloomy winter doldrums. It won't be spring for awhile. Snow is gone and we have promises of ice and rain here this week. Yep, it's February. But, hey, at least it's the shortest month. All gorgeous Kathy. 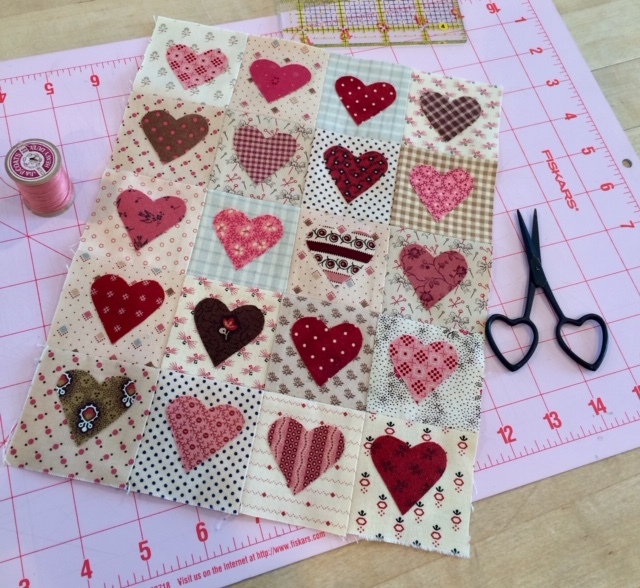 The fabrics you choose play well with each other, Love the little hearts quilt. One that I need to make. Sue - I know you have the scraps, LOL. 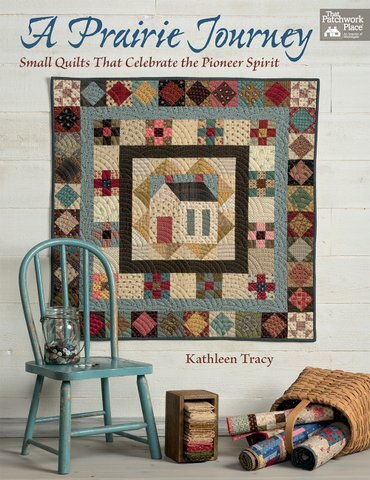 Kathy, I love all your little quilts! That log cabin in pinks & browns is adorable! I never heard of the Louisiana quilt block but I do like it and can't wait to get that far in the Mystery Quilt. Love them all. What is the stitched sampler pillow you have in the photo? Would love to make it too. You have such fun props. Thank you for sharing. Krissy - Not stitched - it's just some old fabric designed by Blackbird Designs I think. Looks real if you're not up close! All of your little quilts are adorable! I especially love those log cabin blocks! 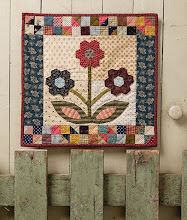 ---"Love"
never tire of seeing all your beautiful little quilts! 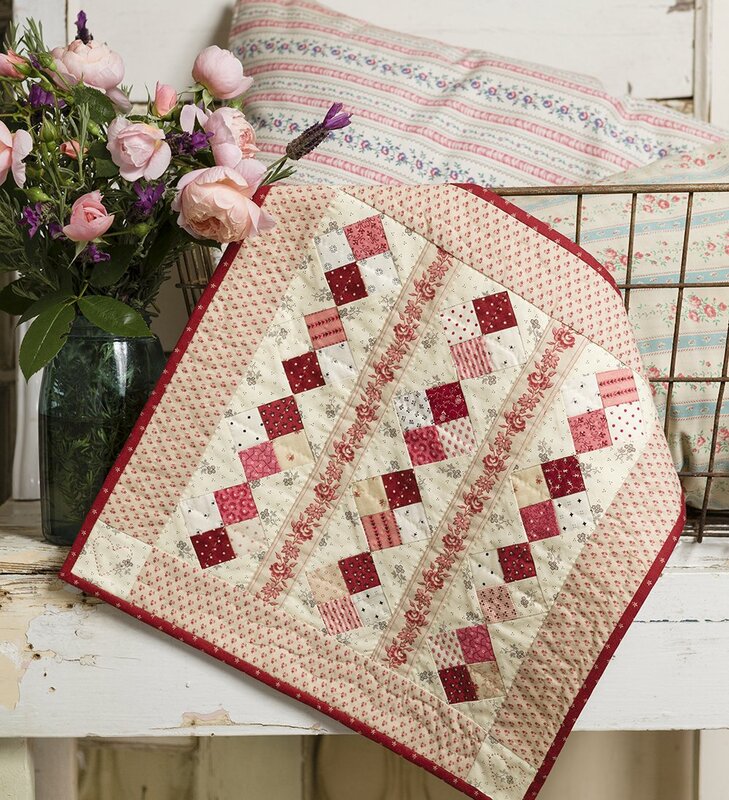 Your fabrics are adorable, just love the colours especially the pinks and browns together. The hearts look lovely as well. 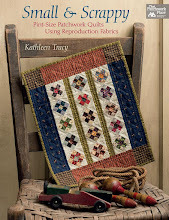 Kathleen: I have a tremendous stash of 19th C. reproduction fabrics in pinks and browns--running out of storage space, actually--I've decided to make a Log Cabin (love that block) 1/2pink 1/2 brown, small blocks, in wall hanging/child size. But I also have a Broken Dishes in mind....Goodness knows, there are enough fabrics to make queen or king size quilts easily. I love all that pink and brown. And your needle case is beautiful, I'm assuming you made it? Sweet, as you are! Blessings. On your little heart quilt featured pattern, does the pattern also include instructions for making the little sewing kit that is beside the quilt and scissors? Lynn - No. That is the Housewife needle case pattern from my book Remembering Adelia. Hi, are the monthly small quilt challenges only available if you are on Facebook? I don't see them in your free pattern section of your website. I don't have FB. Thanks for hosting the 2019 mystery!